Marketing and Business Strategy Insight for Association Professionals. Amazon Average Customer Review: based on 117 reviews. Are you trying to compete within a narrowly defined market space? Is your organization focused on trying to beat the competition? Have you made competition your organization's primary benchmark for strategy? Are you trying to exploit existing demand? If you answered yes to any of these questions, you're probably in red ocean territory. Authors Kim and Mauborgne use the red ocean metaphor to describe an overcrowded market space of competitors all fighting for the same piece of the pie. 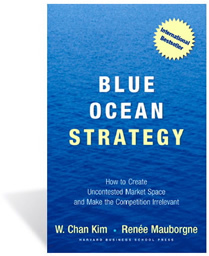 Blue ocean strategy is when an organization breaks away from the conventional approach to facilitate the creation of new uncontested market space thereby making competition irrelevant. To create a blue ocean strategy, organizations must be committed to value innovation. The authors stress that "value" and "innovation" must work together simultaneously in order to develop a blue ocean strategy. Innovation without value involves technology-driven, market pioneering tactics that often lead to over engineered products your market isn't willing to accept or pay for. Value without innovation often leads to value creation on an incremental basis which usually is not enough for your organization stand out in the crowd. A blue ocean strategy focuses on reducing costs and increasing buyer value (differentiation) at the same time. To successfully utilize the blue ocean strategy methodology, you must first learn the tools. The primary tools are the Strategy Canvas, the Four Actions Framework, the Eliminate-Reduce-Raise-Create Grid, and the Three Characteristics of Good Strategy. The x-axis represents the many factors organizations compete on (price, image, support, speed, etc.) and the y-axis illustrates where each company is positioned for each factor. By plotting your organization out against competitors you have a visual representation of where your strategies are in relation to competitors. Identical or similar strategy curves are a clear indication that everyone is trying to outdo the other on the same factors and no organization stands out from the crowd. At the same time, organizations are spending more and more money for competition's sake and profits are eroding away. In this example, Southwest analyzed alternatives to flying (i.e. the car) and designed a unique strategy from the competition (other airlines). Their tagline could be "the speed of a plane at the price of a car - whenever you need it." ELIMINATE factors that no longer add value for the customer; this will eliminate unnecessary costs. REDUCE factors that were over designed or features that were added for the sake of competition; reduces unnecessary costs. RAISE factors important to the customer that have been compromised; utilize some of the cost savings from the first two actions. CREATE factors that have never been offered (a new value proposition). To create a blue ocean strategy you must change your organization's curve on the strategy canvas and move away from the competition. This can be accomplished using the eliminate, reduce, raise, and create framework. It helps to break each section into four quadrants of a grid. Focus, Divergence, and a Tagline - The new strategy FOCUSES on the important areas and not on every single factor, DIVERGES away from the competitors offerings, and has a simple easy to communicate TAGLINE. 1. Reconstructing market boundaries - by analyzing six paths: alternative industries, strategic groups within industries, the chain of buyers, complementary product and service offerings, functional and emotional appeal to buyers, and time (trends). Visual Awakening - visualizing your current strategy (or lack thereof) on a strategy canvas. Visual Exploration - going into the field to explore the six paths identified above; what alternatives exist for your product or service and what are their advantages; what needs to be eliminated, reduced, raised, or created. Visual Strategy Fair - taking the results from the visual exploration and drawing new alternative strategy canvases for group feedback, discussion, and observation; be sure to get feedback from different stakeholders; from the feedback, build the best strategy. Visual Communication - Incorporating and distributing the before and after strategy canvas to your team; going forward, only approve projects and initiatives that will help make the new strategy canvas a reality. First Tier - soon to be customers who are waiting to jump ship for a better option; find out what that better option is that they are waiting for; look for commonalities. Second Tier - individuals that refuse to use the product or service because the price or other features are unacceptable; learn more about why they refuse to use your product or service; look for commonalities. Third Tier - these are truly unchartered waters that competition typically ignores; what possibilities exist? 1. Buyer Utility - Determine if there is exceptional buyer utility (productivity, simplicity, convenience, risk, fun and image, and environmental friendliness) across the six stages of a buyers experience cycle: purchase, delivery, use, supplements, maintenance, and disposal. 2. Price - Determine the strategic price that will generate the volume necessary for critical mass; price should not be based on the traditional cost plus approach but rather on customer value, form and function, and the ease at which your idea can be copied. The price calculation should be: (SP) strategic price - (PM) desired profit margin = targeted costs. 3. Cost - Determine if you can design the product and/or service to meet the targeted cost. This will allow you to strategically create a profit and cost structure that is difficult to mimic. Achieving the targeted cost may mean streamlining, costs innovations, partnering or outsourcing, and price innovation (developing a new model). 4. Adoption - Determine the adoption hurdles buyers will go through and address them up front. If the idea passes through all these steps, you most likely have a blue ocean idea. 5. Overcome key organizational hurdles - Use tipping point leadership to help people understand the need for change. This isn't accomplished through anecdotal stories or force but instead by going out into the field and facing the realities. This includes talking to disgruntled customers and letting your team experience and appreciate the need for change. Organizations have limited resources so pursuing the blue ocean strategy will require strategically reallocating resources to the most important areas. The author uses the term hot spots to allocate resources to areas that require low resource input but have the highest potential for performance. To increase accountability and motivation, leadership should utilize the concepts of kingpins, fishbowl management, and atomization. Kingpins - Get the key influencers on board and behind the blue ocean strategy. Fishbowl - Make strategy progress reporting an open group process where peers are reporting in front of peers. Not many people enjoy explaining their inaction to a group of peers and colleagues. Atomization - Don't overwhelm your team by dumping a large and seemingly unattainable strategy in their laps. Break it down it manageable chunks that are realistic and attainable. It's important to have a consigliore on your blue ocean strategy team - someone who knows the playing field well and can identify and anticipate the resistors. This will allow you to take preemptive action and keep the resistors from sabotaging the blue ocean strategy. Separate resistors into angels - who are in alignment and will gain the most by the strategic changes and devils - who are ready to dig in and battle against the initiative because they have the most to lose. Anticipate and be prepared to counter devil's attempts to sabotage the plan with facts and reason. 6. Building execution into strategy - Like any strategic planning initiative, involve all stakeholders in the process early and often including front line staff - the ones who will most likely be implementing the plan. Employees will champion the new strategy if the organization has done everything they can to ensure a fair process. A good way to ensure a fair process is to follow the three E's - engagement, explanation, and clarity of expectation. ENGAGE your team as part of the planning process and hear them out. Make sure they know you have actively listened to their ideas and input. Be honest and sincere in your actions or you will not gain their trust and support. EXPLAIN to them why you have chosen the strategy you have chosen and state very clearly what the new EXPECTATIONS will be. By using this approach, employees will feel respected and will be dedicated to fulfilling the expectations you have established - even if they do not agree with your final decision. In Blue Ocean Strategy, the authors take a fresh approach to the strategic planning process. Kim and Mauborgne do a great job keeping the concepts simple and providing diverse examples to adequately support their ideas. While the authors retrofit the blue ocean strategy to historical successes, I still believe very strongly that organizations will benefit by incorporating the tools and methods in their strategic planning process. As with all business concepts, the simpler they sounds, the harder they are to implement. Blue ocean strategy is no different. It requires a paradigm shift away from the traditional way (template) of conducting the strategic planning process. This is a must read for association executives. As Thomas Friedman so vividly points out in his book The World is Flat - the world has certainly changed; however, I think many associations are stuck doing things "the way they have always done them." Identify the alternatives to joining your association. What alternatives exist for your current and prospect membership base? If you were to plot the alternatives out on a strategy canvas, how do they compare with your association's offerings? Where do the alternatives fall short? Can you fill this gap more efficiently and effectively? Where have the alternatives over engineered that your association could simplify to offer more cost effective solutions members? Identify organizations (strategic groups) considered to be your closest competition in the industry? Where do they fall short? How does their strategy curve compare with yours on the strategy canvas? What opportunities exist to FOCUS, DIVERGE and come up with a unique TAGLINE? Identify your chain of buyers. Distinguish purchasers from users. Who is actually benefiting from your services? Are their any individuals or companies down the purchasing chain that you have overlooked? Identify complementary product and service offerings. Are there any untapped opportunities for synthesis and collaboration? Identify your product and service emotional and functional appeal. Are you addressing these areas in the design, pricing, and marketing strategies? Identify trends taking place in the association industry, your member's industry and related industries. Are you proactively shaping the trends over time or are you sitting back passively waiting to react and adapt? How much attention are you giving to your first, second and third tier non customers? What commonalities exist? What untapped opportunities exist? Are your association's offerings a mish mash of ideas and fads that came down the pike or were they strategically evaluated before they were added to the mix? What can you ELIMINATE to free up resources and reallocate to more important areas (hot spots)? Have you over engineered products and services with features that are not important to your members? Can you REDUCE some of these features and free up resources to be reallocated to more important areas (hot spots)? What member benefits or needs have you had to compromise because of limited resources? Can you reallocate resources to RAISE the quality in these areas? After analyzing alternatives, the chain of buyers, complementary products and services, emotional and functional appeal, trends, and strategic groups what can you strategically CREATE that will expand your market boundaries? Are you strategically evaluating your association's programs and services to make sure they have BUYER UTILITY? What strategic methods are you using to set the PRICE for your programs or services? If you're not thinking about price until after the product or service has been created, you're doing things backwards. By then you have piled on the costs that you now have to recover at a PRICE your members are not willing to pay. Strategically determine your price first and then determine your targeted costs. Are you streamlining and reallocating to achieve the TARGETED COSTS to provide you products and services at a price that is acceptable to your members? Are you thinking about your member's adoption hurdles and barriers well in advance and taking action to eliminate them? Are you using tipping point leadership to communicate strategic changes? Are you engaging, explaining and setting clear expectations for your team? Are you using the fishbowl concept to create transparency and accountability for your team? Many of these concepts have been around for awhile, but by synthesizing them together it creates a powerful message. This is a must read for any business leader who is striving to make their organization REMARKABLE. As the book illustrates, it doesn't matter what industry you're in, how small or large, or the how old or new the organization is - every organization can benefit from the blue ocean strategy. Order from Amazon Today, you won't be disappointed! Have you read this book? What did you think? Do you have a Blue Ocean success story from the Association world you would like to share? Are You Solving Member Problems? AMS RFPs & Selection What Associations Should Be Doing? Responding to RFPs What AMS Vendors Should Be Doing! What if the Skeptics are Wrong? Successful Associations Hire the Right People! Being a Purple Cow Pays Off! What Associations Should Be Doing? What AMS Vendors Should Be Doing!